This quickie is a real eye-opener! 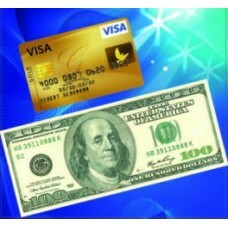 With this amazing gimmick, you can instantly and visually transform a hundred dollar bill into a VISA credit card! Use it in your close-up performances, parlor shows, or even in real life situations! Imagine the look on the face of the cashier when you pay your bill at the supermarket, a restaurant, etc! 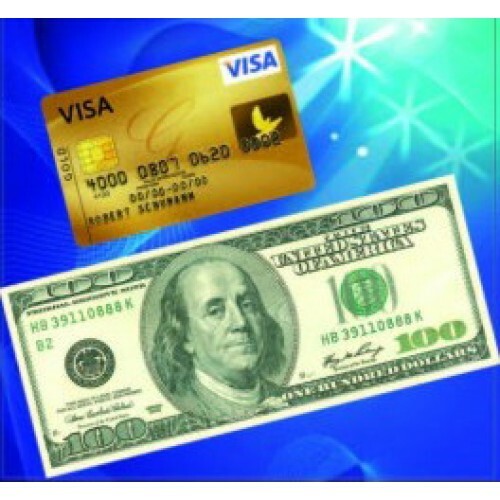 Comes with a beautiful hundred dollar bill replica, the gimmicked VISA Gold Credit Card, and photo-illustrated instructions. You'll be doing in within minutes! Very easy to do with no sleight of hand required! Fully self-contained. Just remove it from your wallet and DO IT!